Moscow (AsiaNews) - Metropolitan Onufrij (Berezovsky), head of the Ukrainian Orthodox Church linked to the Moscow Patriarchate, gave an interview yesterday during the Russian TV show "Morning on Inter", addressing the "hot" topics online and social media. Meanwhile, the Moscow Synod has laid serous charges at the door of the patriarchate of Constantinople, cutting off all ties. At the center of the debate is the possible concession of "autocephaly" or total independence from Moscow of the Ukrainian Orthodox Church and the sending of two Phanar representatives to study the situation. In the interview, Onufrij, leader of the largest group of Orthodox in Ukraine, reiterated his conviction that he already had sufficient autonomy from a canonical standpoint. The "Muscovite" part of the Ukrainian Church, in effect, is organized independently, even if it participates in the activities of the Synod of the Russian Orthodox Church. Commenting on the current polemics, Onufrij is keen to point out that "today they treat us according to political categories, as if it were not Christ to guide us, but some of the party leaders. If I wanted to be a politician, I probably would have become one, without the need to wear these solemn garments ... Those who wear their cassock and then make politics, building fantastic geopolitical plans, are simply dishonest people, who cannot really be priests, they try to attract public attention exploiting the spiritual authority with which they are invested ". Onufrij reiterates that "we are an independent Church. We have all the necessary attributes of autonomy that we need today for the normal service to God and to the people: we have our Synod, the bishops' conference, which makes its decisions in absolute autonomy, without anyone having any veto power over them. This also applies to the ecclesiastical court, the administrative and economic structures ... the Tomos of autocephaly would be for us a limitation of the freedom we now enjoy, and we do not need anything ". For the metropolitan of Kiev relations with Moscow are "normal", following the traditional spiritual, canonical and cultural relations that the Church maintains with every man and all people: "The Church loves everyone, we love Moscow, we love the Russians, but also the Americans, Africans and Asians. We have no enemies or adversaries, and we pray for everyone ". Onufrij also believes that the two "exarchs" sent by Constantinople to Ukraine represent an anti-canonical and unnecessary measure. In this regard, the Synod of Moscow yesterday issued an official statement expressing the "deep disappointment and regret" for the decision of Bartholomew, taken without agreeing with the same Onufrij, and which constitutes an "invasion of a local Church into the territory of another ". The "Phanar representatives", as they are called in the Moscow note, the two visitors (without naming them) would limit themselves to propaganda of the thesis that "the metropolis of Kiev is not subject to Moscow’s jurisdiction", contrary to what the Russians claim. 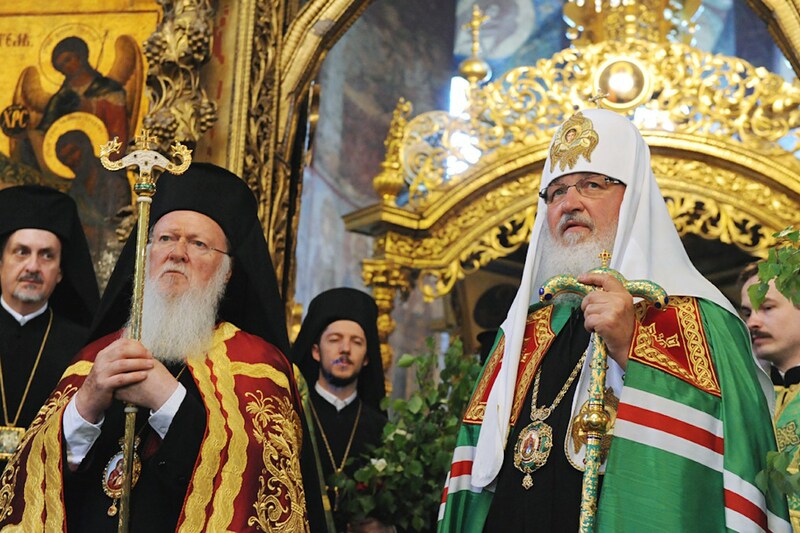 In reality the two envoys of Constantinople, Archbishop Daniel of Pamphilon (United States) and Bishop Ilarion of Edmonton (Canada), are two prelates born in Ukraine and serving mainly in the great Ukrainian diaspora in North America, and it is not the first time that they go to the native country for dialogue and missions for the Ecumenical Patriarchate. Beyond the almost apocalyptic reactions of Moscow, which in fact suspended relations with Bartholomew less than two weeks after the meeting with Kirill on 31 August, the two bishops have no authority to exercise over the local clergy, but only the task of verifying the possible solutions to this long diatribe. Concluding his interview, Metropolitan Onufrij tried to reassure his faithful, distancing himself from any political interpretation and ensuring that "our Church will remain so until the end of time, because the Lord told us that the gates of hell will not prevail over it ". Therefore the ancient patriarchate of Turkey and its hegemonic claims will not prevail. Unless it is not hegemony, but a new season of universal orthodox communion.